Recently the fashion world has been abuzz about a new web film from French perfume house Guerlain for its signature Shalimar fragrance. The almost six minute long “The Legend of Shalimar“ has been hailed by many as setting a new standard for mega-production advertising. It has also set a new standard for epic brand story-telling. In brief, the film is a highly stylised interpretation of the tale of Indian emperor Shah Jahan’s bittersweet love for his wife Mumtaz Mahal, for whom he built the Taj Mahal as a tomb and memorial. Drawing on what its publicity claims to be “The most beautiful love story of all time”, the film features Russian supermodel Natalia Vodianova (who has been the face of Shalimar since 2008) and the stunning settings of India’s Rajasthan state. While some of the aesthetics won’t be to everyone’s liking (in fact there are a number of detractors), there’s no denying the quality of the cinematography and the film’s eye popping scale and special effects, particularly in the closing sequence. The film can be found at the end of this post, so readers can judge for themselves. But before watching it, here are three quick lessons it holds for brand building today. As outlined in a previous post, it is now important for brands to tell a story rather than just have a positioning. 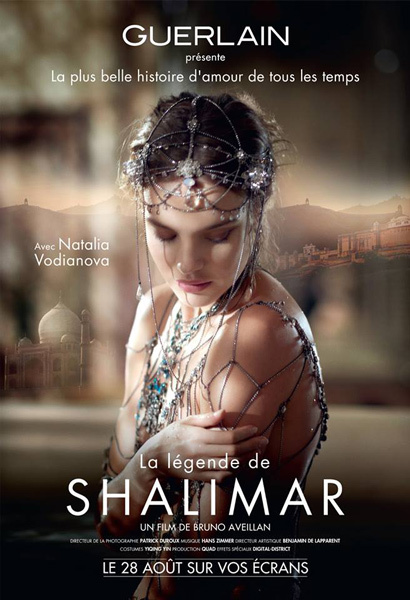 In the case of Shalimar, Guerlain has rediscovered and repurposed a story related to the origins of the brand. The world’s first oriental fragrance, Shalimar was created in the 1920’s by Jacques Guerlain. It was reportedly inspired by Jahan’s love for Mahal, with it being named after her favourite garden, The Gardens of Shalimar in Kashmir. Despite having this to draw upon, it appears that over the years Shalimar has been positioned simply upon its oriental roots as an exotic and sensual scent, as can be seen in this ad from the 1980’s. Even its more recent advertising with Vodianova as brand ambassador has stayed in this territory; though the desired takeout looks to have shifted from sensual to sexual. Overall, however, the brand has not presented a particularly unique set of associations for the perfume category where the themes of sensuality, romance, luxury and elegance are the norm. Guerlain has now looked back into the brand to find an inherent truth about it, and has used that truth to craft an emotive story that clearly sets Shalimar apart. The story is made that much more engaging by the weaving in of magic and fantasy. The rise of fantastical genres in popular culture (think Harry Potter, Lord of the Rings and Twilight) means that consumers are now open to brands also being more ‘magical’. Brands that can fire people’s imaginations will have an advantage. (Author’s note: This topic will be explored further in a future post). Every brand is now in competing for the same thing, a small share of people’s time. Whether ‘new’ or ‘old’ media, somewhere in their communications mix brands need to have content that makes people stand up and take notice, demands to be watched and/or cries out for interaction (and ideally immersion); if only for a few moments. (“The Legend of Shalimar” obviously goes beyond what the vast majority of brands can afford to generate impact. Its settings and special effects have already been mentioned. In addition, the film is directed by one of the world’s leading commercial directors, Bruno Aveillan. The crystal clear, slow motion shots were enabled by a state-of-the-art, high speed Phantom camera. And the musical score is by Hanz Zimmer of “The Lion King” fame). Regardless of their budgets, brand leaders have to think about what to do to gain mind share or heart share when they are competing for these in an ocean of content. Just having the right message – preferably the ‘right’ story – is not enough. At some point this needs to be conveyed in a way that ‘amazes’, if just to a small degree. Here it is. Love it or hate it, it’s hard to argue against the opinion expressed by a colleague that “the bar has just been raised ten notches” for epic brand storytelling. I recently subscribed to your blog and this was the first post that I received in my inbox. What a read! I found it informative, relevant and incredibly applicable to a project that I am currently working on. I happen to be a perfume collector myself so this made the post even more endearing. I look forward to reading your future posts! Many thanks for the feedback Renata. Perfume brands and advertising are particularly interesting. They operate, in old school terminology, predominantly on ‘image’ and allow almost a blank canvas for linking with ‘universal’ needs. It’s actually hard to think of another category that has the same breadth of appeals. « Can Apple keep its cool?